IMPACT! 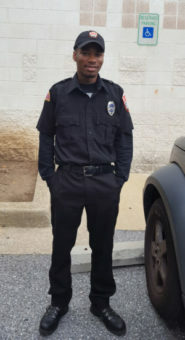 Timothy Scott | Service Coordination, Inc.
Timothy is a 25-year-old male with a big heart and passion for those with any type of disability to be treated fairly. He has overcome many obstacles in his life. He grew up in foster Care, then moved into DDA residential housing. 2015 was a year filled with ups and downs for Tim. From moving to N.C. to moving back to Maryland, where he found himself homeless for a few months. Tim was able to find work at a local car wash, to help pay for housing and food. In 2016 Tim was approved for residential services, which enabled him to gain focus back over his life. Tim found love during this time and married Mrs. Damia Scott on October 3, 2016. She has been a great asset to him. Working with him to improve his reading and writing skills, and helping him to build up his self-confidence. This coming October they will celebrate their one year anniversary, by taking a trip to Las Vegas. This will be Tim’s first time on an airplane. Tim is now gainfully employed as a Security Guard at CVS on Liberty Road in Randallstown. He has worked there for over 2 months. Tim wishes to continue his career as a Security Guard offering assistance and safety to others.